During our previous travels throughout America back in 2012, we spent a majority of our time in Texas. Even after dedicating an entire month to get to know this state, it still felt like we had hardly scratched the surface. Eager to return, we left Utah behind us, headed south through Arizona, hightailed it over to El Paso, and at long last, we crossed yet another state line and found ourselves back within The Lone Star State. Texas is the second largest state in the U.S. and it takes this ranking seriously. Here you’ll find big cities, big portions, big hats, big houses, big everything. However, as every local Texan will tell you, the true spirit of this big state is in its small towns — where romantic landscapes await and historic landmarks continue to breath. By now we had come across our fair share of small American towns, but as of this moment, none had charmed me quite as much as our recent visit to Marfa. As we turned off Interstate 10, something special happened — the sky opened up, the cars became few and far between, and time instantly felt as though it had slowed down. These were clear signs that Marfa was nearing, a quaint town with a population of no more than 2,000, located in the middle of nowhere in West Texas. Yet regardless of its isolated disposition, it has quickly become a buzzed-about destination, with a growing and thriving creative community, making it one of the most visually unique attractions in the country. Perhaps the most well-known display appears just before you even reach the town. Prada Marfa is a permanently installed sculpture of a Prada store that although never opens, welcomes countless of visitors each year (Beyonce being one of them). We stopped here to take photos and stretch our legs, and whilst there, I couldn't help but feel as though a tornado had lifted the store straight from a high-end street and plonked it down on a lonely desert highway. The contrast was both surprising and striking. Continuing on the barren road towards the heart of Marfa, the town's creative culture became all the more apparent with each new art structure beginning to surface downtown. We stopped by the Ballroom Marfa — a dancehall that dates back to 1927 which has now been converted into a contemporary cultural arts space. Although we didn't get a chance to step inside, walking around the crisp white building was impressive enough, with rows of billowing long grass lining the sidewalk. At dusk, we also paid a visit to the Chinati Foundation — the most expansive collection of art in all of Marfa, created by artist Donald Judd. Drawn to the empty desert and in search of change, Judd moved to Marfa in the early ’70s and began acquiring buildings, including the town’s abandoned army base. On this site, the Chinati Foundation was born. There, he installed several untitled works, and later invited other artists to permanently display their work also. Most known is the '15 Untitled Works in Concrete', scattered across the Chihuahuan Desert landscape. Here Judd wanted to create a different way to experience art, outside the confines of galleries, where art is often placed in windowless rooms for short periods of time. We took the 1.5 mile walk and frolicked amongst the installation, admiring the work in its natural environment, as the late artist had intended. Tired from our long drive, we were both eager to call it a day, that was until we came across a local bar called the Lost Horse Saloon. After being drawn in by the neon 'Beer' sign outside, as well as the bottle caps strewn across the carpark, we decided to head in and celebrate our return to Texas with a drink, or two. As soon as we stepped foot inside, the owner caught our attention, a patch-eyed cowboy by the name of Ty Mitchell standing tall behind the bar. We ordered our (very cheap) drinks before parking ourselves at a pool table and playing a handful of games for hours on end. After we left the saloon, we headed towards Tumble In, one of the only two RV parks in town. Once settled back into our motorhome, I was overly excited to rest for the night, but even more excited for the week ahead, for all of Marfa's magic was awaiting me. During the next few days that followed, we really grew to understand why Marfa is having its moment in the light. Whilst the art scene is enough to attract visitors from far and wide, it’s the creative-minded characters who now blow through the town like tumbleweeds, setting up shops and restaurants, that keep this town ever changing. 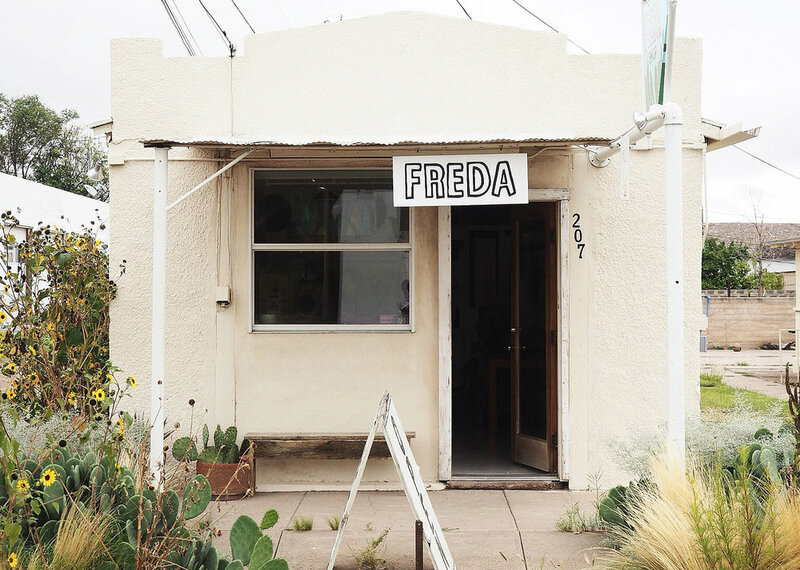 Like the charming boutique shop, Freda, a shoebox-sized store filled with beautifully curated lifestyle products. Or the Do Your Thing Coffee cafe, a local spot that quickly became the go-to place for our morning caffeine kick. Then there's the Marfa Book Company, a bookstore which stocks a modest but exceptionally edited trove of books and magazines. And let me not forget our favourite find, Food Shark, a lunch-only food truck known for its Mediterranean grub, set amongst a front yard filled with vintage cars and an old bus used for seating. With each day we spent galavanting about town, our hungry stomachs would signal lunch o'clock and ultimately lead us here. Their menu changes every day, but the food was delicious, always. Who knows where folks got their afternoon fill before this truck rolled into town, but I for one am thankful for its presence during our visit. 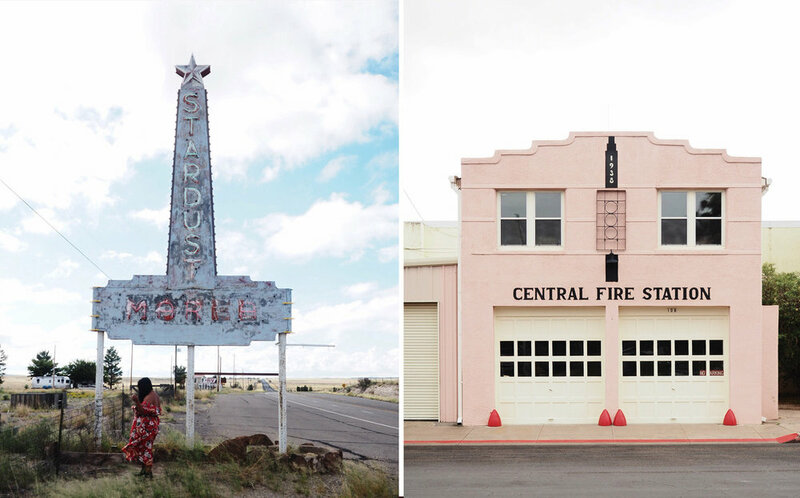 Long before Marfa attracted the art folk, people came to this town to witness the inexplicable. Since 1883, mysterious lights have been spotted at a place nine miles east of Marfa, known as the 'Marfa Lights'. These lights have become such a phenomenon that people travel cross country just to see them. Keen to see what all the fuss is about, we headed to the viewing platform one night, where we joined a crowd of people, staring determinedly out across the desert scrub. As the night grew darker, we began to see lights appearing and disappearing on the horizon. Some say they are caused by bubbles of gas from a fault line in the area, igniting and burning out, whilst others have a more fanciful opinion, believing that they are in fact UFO sightings. I on the other hand, didn't want to over analyse them, instead choosing to simply enjoy the mystical experience. After curious observation, there's no doubt that the newcomers who have moved to Marfa, have come in search for a simpler life. In total, the town has zero major banks, three ATMs, and exactly one fast food restaurant. Even the town's shops operate on their own individual clocks — some don't open until 11am, some close at 3pm, whilst others don't operate on Monday and Tuesdays at all. Perhaps it's this lack of consistency that may deter visitors from enjoying their visit, but for me, it's these characteristics that define Marfa as a town that unapologetically moves to its own rhythm. 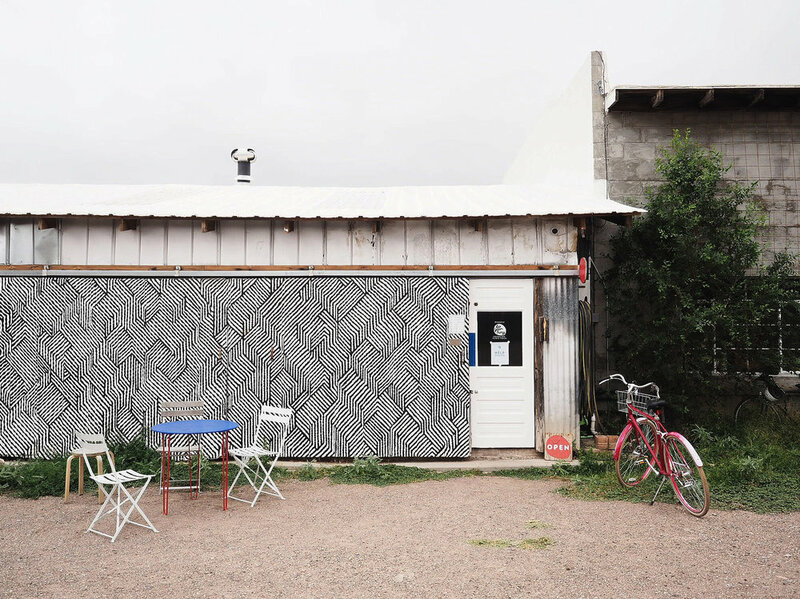 Operating hours aside, Marfa holds great allure to its guests, even during the stillness of those odd hours where you find yourself alone in its streets. Turn one corner and you'll find playful murals painted on abandoned storefronts, turn another and you'll find neon signs humming alongside the road, and as if this wasn't enough, even the local fire station in town is painted in bubblegum pink. I truly could go on, however, I will end it with this note — Marfa is a tough town to get to, and an even tougher town to explain. But once you do get there, you'll get it, and everything else will fall magically into place.